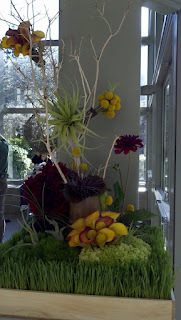 In February we participated in the Northwest Flower and Garden Show floral competition. Our floral, shown below, won first place! 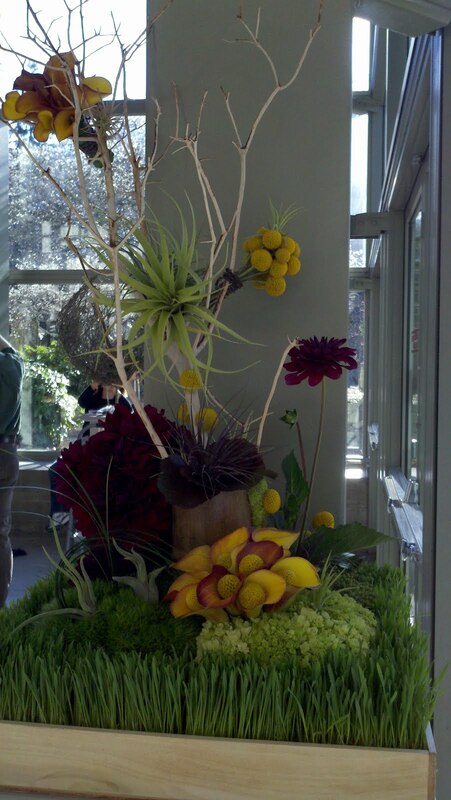 Jean Louise Paquin Allen, owner of Juniper Flowers designed and installed this arrangement. custom built wood box, wheat grass, green hydrangea, green ball dianthus, berzillia berries, orange flame mini calla lilies with craspedia centers, red dahlias, lily grass. A hollowed out bamboo cup held the manzanita branch which provided the structure to hang several bouquets on. Bouquets consisting of craspedia and mini calla lilies. Also hung and specifically nestled into the arrangement were different sized tillandsia (air plants). It was such a fun and refreshing floral display to create!